Part of working on Hotel Demand Management, Hotel Analytics and Hotel Data, and its many layers, meant getting a good grasp of the segments, and the technology players. We thought we could help hoteliers, and future hoteliers, by illustrating our efforts with a simple chart. 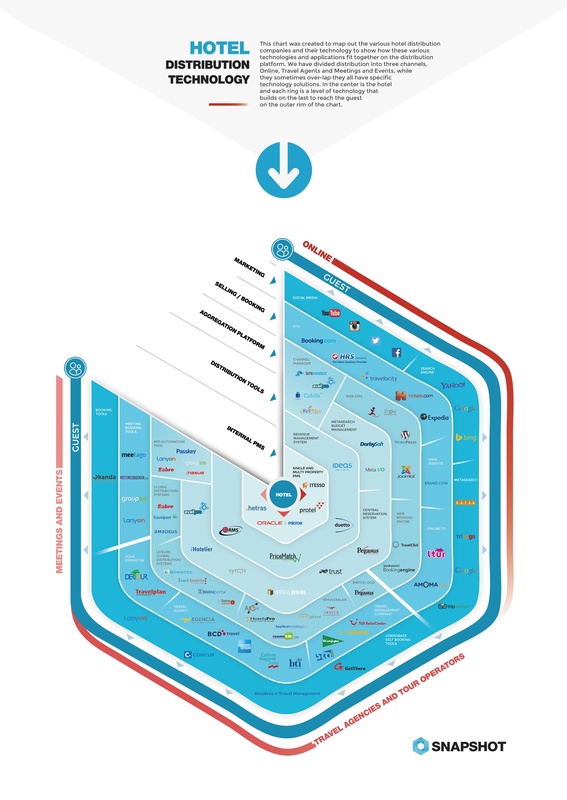 Here is the first version of The Hotel Distribution Technology Chart. It should to help you by illustrating the various technology providers and how they dovetail one to the next. By understanding the technology players on the market and their hotel tech segments, you can get an idea of the data that is potentially available at each level and thus start working out your big data, small data and so forth. The chart is divided in three main distribution segments: Online, Travel Agents and Events and such distribution services as Shiji Distribution Solutions. These groups represent the majority of the business hotels receive. Within these three segments there are several layers, which go from the hotel (center of the chart) towards the guest (outer rim of the chart).